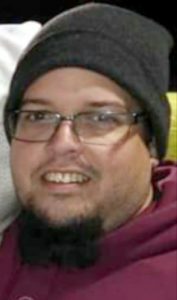 Hector L. Mendez, Jr., 34, of Manheim, passed away peacefully on Saturday, February 2nd, 2019 after a courageous battle with pancreatic cancer. He was the loving husband of Dusty (Mattern) Mendez with whom he shared 15 years. Born in Queens, NY he was a son to Hector L. Mendez, Sr. and Marie Roldan. A country boy at heart, Hector moved from the city of New York to Lancaster in his junior year where he would graduate from McCaskey High School. He became known to his friends as “Hungry”, never turning down a good meal. A kid at heart, Hector enjoyed watching Star Wars, Lord of the Rings, Godzilla, Ghost Busters and many other classics that his children had the joy of sharing with him. He was a loving and dedicated father, and the epitome of a “sports dad”, never missing any of his kid’s sporting events. During the 2018 PIAA CLASS 5A CHAMPIONSHIP, the Manheim Central Senior High School, Barons football team dedicated their game and season to him, lifting him high into their arms in a show of love and gratitude. It will be a day that his family will always treasure. Hector found solace in chasing the sunset, lying under the stars, taking a walk through the woods and casting his reel. His family and friends will remember him for his vast knowledge of Viking history and Greek Mythology and for his desire to share his knowledge with others. In addition to his wife and parents, he is survived by his children: Dominic Pietsch, Haili Pietsch, Gwyneth Mendez; sister, Katherine Castrejon; brothers, Joshua Mendez & Jonathan Richardson; maternal grandparents, Jose and Julia Roldan; paternal grandmother, Eva Rivera; god mother, Martha Barra and a host of aunts, uncles and cousins. There will be a memorial service on Thursday, February 7th at 4pm at the Charles F. Snyder Funeral Home & Crematory, 3110 Lititz Pike, Lititz, PA 17543. The family will receive guests from 2pm until the time of service. In lieu of flowers, the family requests memorial contributions be made to the Manheim Central High School Athletic Department, Attention Business Office, 281 White Oak Road, Manheim, PA 17545. To dusty a wonderful wife i send my prayers. And hector you fought hard and heaven gained a beautiful angel. I’m still in shock to know your gone. I’m so sorry to hear you lost Hector. You had a good man. We all love you Dusty. No words can express how much Hector meant to our boys. Our Friday Nights won’t shine as bright without him. May you find comfort in knowing he is no longer in pain. This family would do anything to help anyone. Lean on us. We love you all! Loved ones are never gone, they live within our hearts. May you find comfort in all the wonderful memories that he has brought to your lives. Rest in peace Hector. You will be missed by many. So sorry to hear about Hector’s passing. He was always pleasant, and made me laugh. I’ve missed him at work these last few months, and I am really sorry that he won’t be coming back. What a great guy you were. Rest with God, Hector. So sorry for your loss he was a great guy. Love and condolences to the family! He will be missed. With Love and my Deepest Condolences. My prayers to all the lives that Hector has touched; From the family and friends. Taken so soon. Dearest Hector rest in Peace. Love you. Where does one begin? How does one relive the ups and downs in life in a blink? Why do things come up short? Where can people share the memories of gold before they fade into the air? See we don’t have answers for them. We can only apologize for not being there to see you go. It’s so hard to say goodbye to yesterday because of the memories we’ve enjoyed from beginning to end. You’ve been a town brother, a generous colleague to talk to, a life long friend who wouldn’t say no when it comes to enjoying something new. You’ve been many things to many people. You’ve touched so many people’s hearts the words just won’t be enough to describe the love you’ve spread around. Your appreciation of family proves that your loyalty, commitment, and passion for life itself is one of a kind. I’m so sorry to see you go, my longtime friend. Here’s to hoping the next adventure we embark in will be the greatest one of our lives. And hopefully afterward, we can see the most beautiful sunset nature can give us. I wish to send my love, prayers and deepest sympathies to the Mendez family and friends, for the loss of your dearest Hector. A quest for knowledge, a kid at heart. A love of nature, and for life, what wonderful gifts to share. Although I did not have the great pleasure of knowing him personally, he was extremely important to those who are very special to me. Difficult times often bring people together. And in that unity, love and light embrace, comfort, and bring a healing peace. May you feel such a loving comfort during this most sorrowful time. For surely, one who so loved to lay beneath the stars, now, his own bright light joins them, as it radiates love, smiling down.